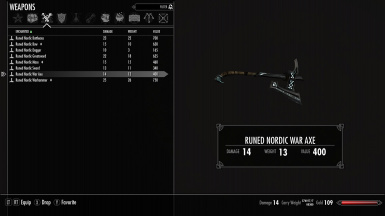 Standalone retextured Dragenborn DLC Nordic Weapons with glowing runes. English and German version available. 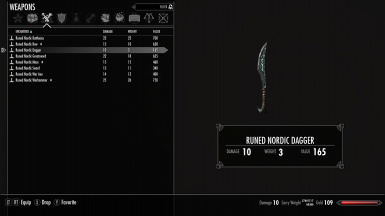 This mod is not mine. It is mainly a port to Skyrim Special Edition based on the work of foxlight713. Some adaptions were made by me. All credits go to foxlight713. A permission declaration you will find below. Note: I don't accept any kind of donations. Furthermore I will not take part on the new announced mod authors donation system in any way. When you feel you should donate, please give some money to the animal shelter next to you. Of course you can donate the original-author when you find a donate-button on the original page. Let modding be free. Forever. The added dragon runes are a visual improvement only and do not have any other meanings. The meshes are optimized with Nif-Optimizer. I have tried to upscale the original textures from 1K to 2K via GIMP 2. The result is difficult to see. Because of this the main version is in 1K still. Try out the new 2K version if you want. I am open for suggestions doing it better. The weapons are standalone. This means no other items will be overwritten. 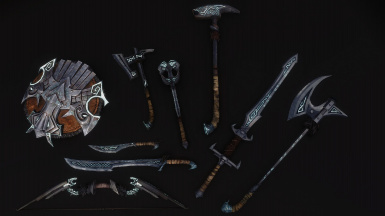 The weapons can be crafted, tempered and enchanted. 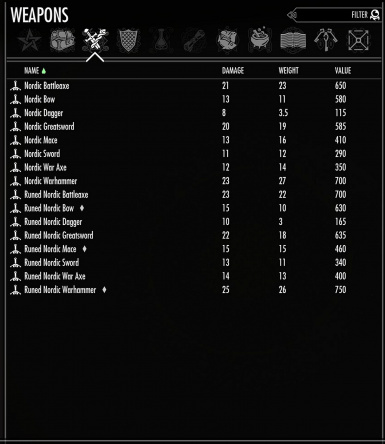 For crafting you will need the smithing perk Advanced Armors. 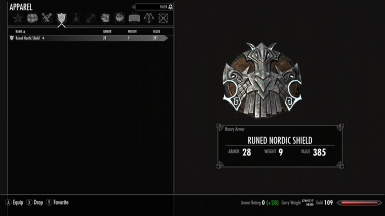 The mod is cleaned and checked for errors in TES5Edit. Use Mod Organizer (recommended) or Nexus Mod Manager. If using manual installation unpack the 7-zip-file in your Skyrim data directory. Runed Greatsword does not appear on followers. A: The mod adds new items only. No original assets of skyrim are affected. The mod should be compatible with everything. Q: Why did you improve the stats of the weapons ? A: Why not ? I mean they are runed. Magical. Unique. A: I don't use XB1. Q: Can you build a bsa-file ? A: I use loose files only for all my mods. If you want a bsa-file you have to do it by yourself. Q: Why do you use loose files only ? A: This is my personal decision. There are many discussions about the topic bsa vs. loose files already. This is not the right place for a new discussion. A: You can report it in the bugs section of this page. I will try to fix asap. A: I don't need any complaints how you don't like the mod. Use another mod. The assets in this mod are free to use and can be modified and uploaded. Author notesFree Use as long as credit is given and the original author is notified.